Amasty has just released its Advanced Reports extension for Magento 2, and we reviewed it here: Amasty Advanced Reports for Magento 2 and 1. Besides, our blog already contains two posts dedicated to appropriate solutions by Mirasvit and Aheadworks, so now we’d like to compare all three Magento 2 modules to find out which one is the best. Let’s start our comparison with the number of reports, as this feature will help us figure out which Magento 2 module is the most informative. The Magento 2 reports extension by Amasty offers 14 detailed reports, which is even more than in case of its Magento 1 predecessor (9 types). Are they all indispensable? We will provide the answer later since there are still two more tools shrouded in mystery. To reveal the shroud over the Mirasvit Advanced Reports Magento 2 extension a little bit, we should tell you that it offers 22 reports out of the box. Looks more impressive than the Amasty extension, but we still have no idea on the usefulness of each report. So, what about Aheadworks? The Magento 2 reports module by Aheadworks offers 12 reports out of the box, but in total it includes 18 if we consider Customer Groups filters as a separate report. So, which reports are available in case of the Magento 2 reports extension by Amasty? New vs. Returning Customers – are you converting first-time buyers into returning visitors successfully? Find out via this report. So, it seems that the actual number of reports offered by the Amasty Advanced Reports Magento 2 Extension is a little bit lower (10), but let’s have a look at its competitors. Abandoned Products – not available in Amasty Advanced Reports for Magento 2. As you can see, Mirasvit offers some unique reports compared to the ones provided by Amasty. What about Aheadworks? Customer Sales – Sales by Customers reports provided by Amasty and Mirasvit have nearly the same type of analytics. In case of all three Magento 2 reports modules, you can easily set a period for the report. It can be a day, week, month, or year (Mirasvit and Aheadworks also allow choosing Quarter as a time interval). Besides, it is possible to select a store view and export all data as CSV or XML. 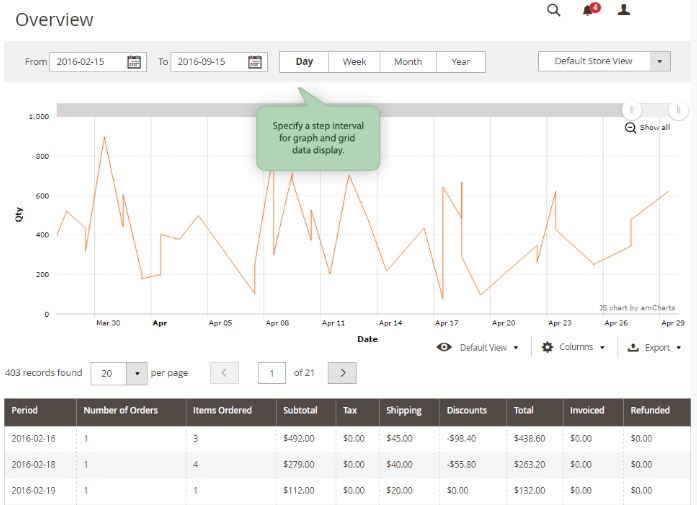 As for the grid functionality and data, the Magento 2 reports extension by Amasty provides the following 10 columns: Period, Number of Orders, Items Ordered, Subtotal, Tax, Shipping, Discounts, Total, Invoiced, and Refunded. You can quickly hide ones that are not necessary for your business. In case of Mirasvit, the grid consists of 11 columns: Period, Number of Orders, Total Qty Ordered, Discount Amount, Shipping Amount, Tax Amount, Total Refund, Subtotal, Actions, and Average Discount Amount. It lacks the Invoiced column but offers two new columns: Actions and Average Discount Amount. Each column can be hidden. As for the Aheadworks Magento 2 reports module, the Sales Overview grid contains 12 columns: Period, Number of Orders, Items Ordered, Subtotal, Tax, Shipping, Discounts, Total, Invoiced, Refunded, The last two columns are unique. Al three reporting solutions offer the same core data. Note that Mirasvit lets you display all parameters from the grid on a diagram, so it is possible to customize its appearance within just a few clicks. In case of Aheadworks, you can add all indicators to the diagram, except Avg. Order Amount and Avg. Item Final Price. Unfortunately, this feature is not available with Amasty. 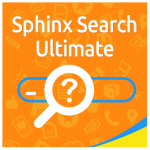 It is also necessary to mention that there are lots of other vital features all the extensions offer (or don’t). First of all, it is export. Magento 2 reports modules by Amasty, Mirasvit, and Aheadworks provide the ability to export report stats as a CSV or XML file. 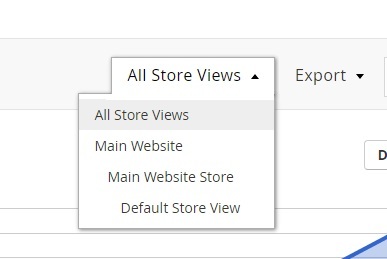 As for multi-store capabilities, all three Magento 2 advanced reports extensions allow you to check data related to each store view separately. Visual representation is a part of all three Magento 2 reports modules, but only Mirasvit provides the ability to switch between three different views. Filters are available in Aheadworks Advanced Reports for Magento 2 (predefined ones, such as Day, Week, Month, Quarter, and Year), as well as in case of two other Magento 2 modules. Grid flexibility: both Magento 2 reports extensions by Amasty and Mirasvit provide the ability to show/hide columns. Maybe, it is not the most important feature, but it makes your grid more accurate and your daily routine less irritating. Although we can already see that Mirasvit has several competitive advantages over Amasty and Aheadworks, it is necessary to compare extensions’ prices: $299, $119, and $499. If you think that Aheadworks Advanced Reports for Magento 2 costs $119, you are mistaken. This Magento 2 reports module is the most expensive – $499. 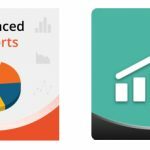 The tool with the most extensive variety of reports – Mirasvit Advanced Reports – can be purchased for $119, which is the lowest price in comparison to its competitors. The only left price tag – $299 – goes to Amasty. What does it mean? We provide our final thoughts right after the final table. As you can see, all three Magento 2 reports modules offer the same top-notch functionality. 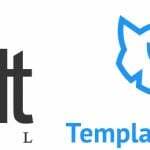 Magento 2 reports extensions by Amasty and Aheadworks provide almost the same features as Mirasvit, but the total number of reports and a price tag of the later makes it the best option for adding the advanced reports tool to an ecommerce site.